This weekend was brought to you by sunshine! Kyle and I went and looked at a house Friday morning but walked away unsure about it. Actually – he liked it and I was unsure. The neighbourhood is exactly where we want to be, but the house itself needed a lot of adjustments/updates that weren’t really reflected in the asking price. I know – we kind of just bought the house we’re in now (November 2011), but we’re already running out of room and would like more space. This hunt won’t continue much longer since I’m only getting more pregnant and moving with a newborn would be zero fun, so we’re getting frustrated with the lack of options there are on the market right now. Anyway, after that we picked up some food from the grocery store for lunch and spent the rest of the afternoon outside in the sunshine! Kyle worked an overtime shift so it was just Isla and I! We met a friend at the park just down the hill from our house where we played in the playground, had a little picnic lunch, and fed the ducks! The ducks/geese really appreciated Isla’s generous portion sizes too. After the park we didn’t feel like heading home quiet yet, so we headed down to my mom’s for a visit! Isla had some more lunch (growth spurt maybe?) and we went outside to enjoy the sun some more! We were outside from about 11am to 3:30pm, and it showed once I put Isla to bed. Even though she napped on the way home from my mom’s, she still crashed hard at bedtime. Oh, also, around 7pm Saturday, before Kyle got home from work, our landline starts ringing and when I answer it’s a lady asking if I own a pit bull. I say yes, completely forgetting that I had let Campbell outside. Well, apparently he had escaped and was hanging out on this lady’s patio in her back yard. Mother f-er! Luckily she was just down the street, so I packed Isla into the car, grabbed Cam’s leash and went to get him. They didn’t seem overly bothered by him (i.e., not intimidated by the fac that he’s a pit bull), and commented on how friendly he was. At least Campbell was winning that way, because he was in so much trouble! We did our routine grocery shop for the week and after lunch we headed down to Kyle’s mom’s for a visit since his grandparents had just returned from their snowbirding trip to Arizona & Hawaii. 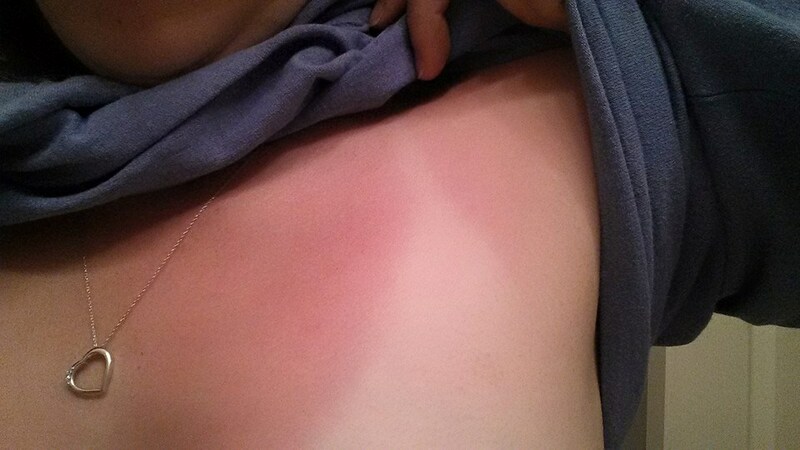 I spent a little too much time sitting in the sun and got my first sunburn of the year. Oops. After dinner we came home and I got Isla bathed and into bed. Kyle and I watched the rest of the Vancouver vs. Calgary hockey game, and then went to bed ourselves! Despite the sunburn, I’m so glad that the weather is nice! I live for this mid-20°C weather. When it creeps up towards 30°C I get a little cranky, but this weather (and this weekend) was perfection! How was your weekend? Did you get sunburnt? Sounds like a fun weekend! It was cold and windy here in Edmonton so no sunburn for me! Maybe this week? We found a loose dog in the park on Friday afternoon so most of Friday evening was spent tracking down her owners and trying to console the kids when they realized they weren’t going to be able to keep their new best friend. I’m glad someone nice found Campbell – in our area a loose pit bull causes mass hysteria, even though both of the ones I know in the neighbourhood are really friendly! Ahhhh don’t rub it in. I spent the weekend in first aid training. Whomp whomp. What a bad weekend for me to choose to do that hey? Too bad I booked it months ago. Sigh. I had no idea you guys were house shopping!! Hope you find something soon! Ow that sunburn does NOT look fun!